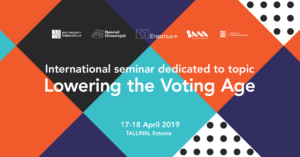 On behalf of Estonian National Youth Council we are pleased to invite you to participate on international seminar dedicated to topic of lowering the voting age. In May 2018 Estonian National Youth Council in cooperation with Children’s Voice Association from Finland organised thematic seminar in Parliament of Estonia dedicated to Estonian experience in lowering the voting age for local government elections. Due to high interest from participants and partners we decided to organise second-phase of the event which will focus to possibility of lowering the voting age in European Parliament elections which has been one of the recommendations from the Parliament to memberstates of EU. The seminar aims to share arguments in favour or against the topic over all, investigate practices, data and impact of European countries which already have lowered the voting age and to initiate dialogue between youth and decision-makers about each expectations and cooperation outlooks. Due to upcoming European Parliament elections it will be one of the scope areas of the seminar. The seminar is funded by Erasmus+ programme through Estonian National Youth Agency and Republic of Estonia Ministry of Education and Research. 1st session: Why is it Important to Empower Youth? Expected outcome: better overview which challenges youth might challenge, which impact empowering the youth through Vote@16 might have and why this topic should be priority in “youth-agenda”. 2nd session: How the Society Can Benefit from Vote@16? Expected outcome: better overview about positive and negative arguments how Vote@16 affects society as whole. How it could support or reduce position of other age groups? 3rd session: By Which Strategies Can We Achieve Our Goal? Expected outcome: better overview about different strategies, methods, practices and their impact in different contexts. Why Should Youth Care about (Future of) Europe? How Should Youth be Involved into Discussions about (Future of) Europe? Expected outcome: better overview about already existing youth inclusing and EU “mainstreaming” mechanisms and their impact. 5th session: By Which Measures Can We Advance Youth Participation in Society? Expected outcome: an understanding about different perspectives about the topic (either positive or negative (side-) efects. Also new convincing arguments for planning lobby-process in participant’s home region and understanding how youth and decision-makers could cooperate in that process. Discussion to reflect ideas and proposals from previous sessions. Expected outcome: an understanding which might be good arguments for initiating lowering the voting age discussions in participant’s home region.